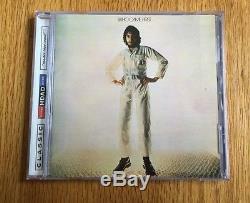 Pete Townshend (The Who) solo album "Who Came First", on incredible DVD-Audio/HDAD DVD Hybrid disc (high quality audio). This is a DVD-Audio disc which is playable on most DVD players as well as all DVD-Audio players. Both sides of disc are playable on different equipment. One side is the DVD-Audio side, the other is the HDAD side. It has an extremely high audio quality and the 24 bit/192 kHz transfer was from the original 2 track 1/4 analog tape (mastered by Bernie Grundman). Disc comes from my personal collection and is in EXCELLENT like-new condition. Both sides of the disc have shiny surfaces with no visible scratches or marks. The case and inserts too are in excellent like-new condition with no rips tears marks or scratches. Pete Townshend's first solo album is a homespun, charming forum for low-key, personal songs that weren't deemed suitable for The Who, as well as spiritual paeans (direct and indirect) to his spiritual guru Meher Baba. Who fans will be immediately attracted by the presence of a couple of songs from the aborted Who concept album Lifehouse (much of which ended up on Who's Next), "Pure & Easy" and Let's See Action. The Who did eventually release their own versions of both those songs. This record shows a folkier and gentler side to The Who's chief muse. "Sheraton Gibson" is a neat tune about rock & roll road life, and "Time Is Passing" takes very subtle inspiration from Baba. Most of the rest of the album contains some of the most unusual pieces Townshend has released: his acoustic cover of Jim Reeves' "There's A Heartache Following Me" (recorded because it was one of Baba's favorite tunes), "Evolution" (which is actually pretty much a solo track by his buddy Ronnie Lane of The Faces), "Parvardigar" (adapted from Baba's Universal Prayer), and "Content" (a philosophical poem by Maud Kennedy that Townshend put to music). (thanks to Amazon reviewer) WHO CAME FIRST mixes a batch of unrelated tunes--some rejected by the Who, some Townshend didn't want to give the Who, and some surprising covers--and fuses them into a little gem of a record. "Pure & Easy" is one of the best songs Townshend ever wrote. Townshend does a great acoustic version here. Lane takes the lead on "Evolution" which is... Like your neighbor sitting on his back step with a guitar and a pint of Guiness. I love the sappy acoustic tunes "Time Is Passing, " "There's A Heartache Following Me" and, especially and always, Sheraton Gibson. Just great, great, great stuff from a period when Townshend could do anything--ANYTHING--on the guitar. The most intimidating wizard of all, in my book, even more so than Hendrix because Townshend never lost the beat in the midst of his revery how's that for a poetic twitch? And "Content" is almost angelic. Other than George Harrison I can't imagine anyone in Rock at the time (1972) who would have dared be this fragile and prostrate on a solo LP. For all his human shortcomings, Townshend remains my hero--guitar, spiritual, philosophical, whatever--and this album demonstrates the real heart of why that came to be. There are no hits, and that's really the point: this was a demonstration of a kind of faith, not an attempt to conquer Top Of The Pops. Later in the 70's Townshend would fight an internal battle to mix this kind of spiritual enlightenment with an urge to remain commercially viable; he would try to inject this kind of philosophical openness into a Rock/Pop Rock format. Whether or not he was successful--and whether or not that effort led, in part or in whole, to the creative collapse of the Who--is a wordy issued we can debate some other time. This is a great record, though, no matter how you approach it. Forever's No Time At All. (Nothing Is Everything) Let's See Action. There's A Heartache Following Me. 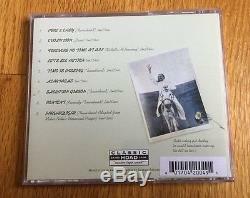 The item "Pete Townshend Who Came First The Faces Ronnie Lane DVD-Audio HDAD Hybrid 24/192" is in sale since Saturday, September 26, 2015. This item is in the category "Music\Other Formats". The seller is "big-farma" and is located in Sandy Hook, Connecticut.